* click here for information on the shelf life of NATTO. Natto is fermented soybeans. Natto has long been recognized as one of Japan's most unique traditional health foods. Highly nutritious and rich in protein, it is often eaten with cooked rice. For centuries, natto has been made using a specialized fermentation process by adding beneficial bacteria, Bacillus natto to soybeans. Fermentation enhances the nutrition of soybeans and develops a unique flavor and texture. Its physical texture is sticky and is a natural result of the fermentation process. Natto has recently received keen attention because of its natural enzyme, Nattokinase, discovered by Dr. H. Sumi at University of Chicago in 1980. Within Natto's texture consists a complex of poly-glutamic acid and poly-saccharide, fructan. Dr H. Sumi, currently professor of Kurashiki Arts and Science University, discovered high activity of blood clot dissolving enzyme in the sticky portion. The characteristic aroma is due to Pyrazine. It is somewhat similar to the one of bacterial surface aging cheese like Limburger from Belgium, Liederkrantz or Brick or Cheddar from the US, St. Paulin or Brie from France, Muenster from Germany and Bel Paese from Italy. Fermentation is a process driven by microorganisms. Microorganisms need fermentation to generate energy, build their "bodies" and to reproduce. Humans, at top of the food chain, utilizes fermentation primarily to preserve food, to avoid spoilage and enhance nutrition. Humans selectively use beneficial microorganisms to convert raw food stuffs to fermented products, which other microorganisms cannot further spoil. Fermentation can also increase palatability, nutrition and physiological functions, and decrease undesirable substances and functions. Cheese, soy sauce, Kefir, yogurt and other dairy products, pickles, some sausages, wine, and beer are among fermented foods which have sustained and enhanced our lives for many centuries. Soybeans were an important protein source in the areas where meat eating was prohibited or limited by religions or customs. Dry soybeans can be stored for prolonged periods. However, when soybeans are moist, they can germinate or become rancid. Another way to preserve soybeans is by fermentation. Fermented soybeans are well liked in rice eating cultures throughout much of Asia. Soy sauce, soybean miso paste are fermented soybeans used as condiment for seasoning foods. Natto is another fermented soybeans in Japan and Tempe in Indochina. How long does your NATTO fermentation process take? It takes approximately 20 hours of constant temperature management for NATTO to ferment. Your NATTO sample tastes and smells far more mild than the frozen NATTO I have tried, why is that? I believe there are 2 reasons for that. First, we use carefully selected, high quality soybeans for our NATTO. The second reason is freshness. Megumi Natto is made fresh and never frozen. Most NATTO sold in the U.S. is imported from Japan, and depending on the amount of time that elapses until the product is frozen, and the condition that the product is in during transport and storage, the fermentation process may get accelerated, leading to stronger flavors and smells. Can beans other than soybeans be fermented in this way? Yes, other beans can be fermented in the same way. However, the taste and smell of other fermented beans will differ, because of the inherent difference in the levels of protein and sugar. 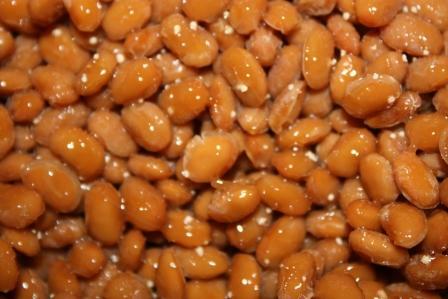 Indeed, soybeans were probably chosen out of the myriad beans available in Japan because of the ability for NATTO to maximize the bean’s nutritional benefits. How does this soybean differ from the black bean NATTO I have tried in Japan? Japanese black bean NATTO is made from black soybeans, so the nutritional content is the same as regular soybeans. Is it recommended to eat NATTO with mustard? That depends on your preference. In Japan, most people put mustard in their NATTO. Other condiments that go well with NATTO are wasabi, salt, grated daikon radish, green onion and soy sauce. NATTO can be frozen – please do so during its shelf life, and determine the timing by the level of fermentation you prefer. Please thaw in your refrigerator and consume immediately after thawing. The flavor of defrosted natto will be inferior to fresh NATTO. (Note): Because fermentation levels will vary depending upon conditions under which the natto is maintained during distribution and storage, the above time frames are rough estimates. How long can NATTO sit under a heat lamp and maintain its taste and texture if it is being served in food service environment? Placing NATTO under a heat lamp will not speed up fermentation. NATTO is not maintained in this manner in Japan so it is difficult to say, but one should handle NATTO as they do cheese. Keeping the NATTO out for an hour under a heat lamp will probably lead to the beans becoming gooey and slimy and an intensification of the smell. Is it possible to cook hot dishes with NATTO? When the enzyme Nattokinase is heated to a temperature of 150 degrees Fahrenheit or warmer for more than 10 minutes, the enzyme loses its effectiveness. However, you may add NATTO to your favorite pasta dish, to an omelet or hot dish of choice at the end of preparation and NATTO will keep its nutritional integrity. See our Recipe section for ideas and preparation tips. What are the white spots on the beans? As NATTO continues to ferment, the proteins start to break down into amino acid crystals. They are safe to eat. Is it normal for my NATTO to be so stringy? Yes, the sticky string (a form of glutamic acid) includes the active ingredient, nattokinase. It is part of what makes natto unique. There is a distinct odor, is that normal? If it is a strong smell, similar to ammonia, it means that the NATTO has over-fermented. How often do you recommend eating NATTO? You should always consider your caloric needs first and foremost, but many people eat 1 cup of NATTO everyday. May I buy this in bulk quantities, if I want to purchase on a regular basis? Yes, if you request our NATTO in the shallow plastic container (approximately 9” x 6” x 2”), we are able to make our 500g NATTO. In this case, you would have to order a week in advance and pick-up the product from our factory, or schedule a periodic pick-up.